New March 2014. This section provides access to the official population estimates and components of change released by the Census Bureau in March 2014. Use data access tools summarized below to examine patterns and characteristics of demographic change by county and metro. 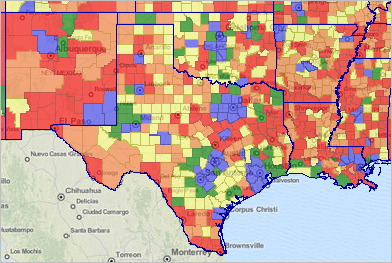 Use the interactive tools in this section to flexibly examine counties, metros and metros by county. Examine annual change in population by component of population change (births, deaths, domestic migration and international migration). View metros of interest by county components and how each county contributes to the make-up and change for specific metros. CTYPOP2013 GIS project start-up view. CTYPOP2013TX GIS project start-up view; illustrates visual analysis of net migration by county for 2013 (mid-2012-mid-2013); uses same project files as CTYPOP2013; only query and zoom settings differ. Use the interactive table shown below to examine counties, metros and metros by county. Examine annual change in population by component of population change (births, deaths, domestic migration and international migration). The next two graphics are screenshots of the table. Develop your own similar rankings for states of interest (use filter selection below table). Ranked in descending order on far right column in graphic.